2WD “AR62” American Outlaw wheels - 15x7 or 15x8? I’m restoring my 88 d21 2wd auto z24i. I’m about to purchase some American Racing AR62’s to replace the stock 14” wheels. I want a nice lip but don’t want it out rather than sides of truck. I did a 4WD fender conversion. How much difference will the 1” of width make? Too much weight? Too wide? What offset? I believe the standard offset for the 4wd on 15x6 steelies is -40mm and the 15x7 alloys is -30mm. My 15x7 with 0 offset come out to the edge of my huge fender flares. 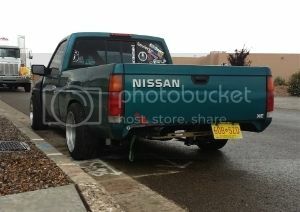 I run 15x8.5 -32 and its perfectly flush with 4x4 fenders w/ no flairs up front and flairs in rear.